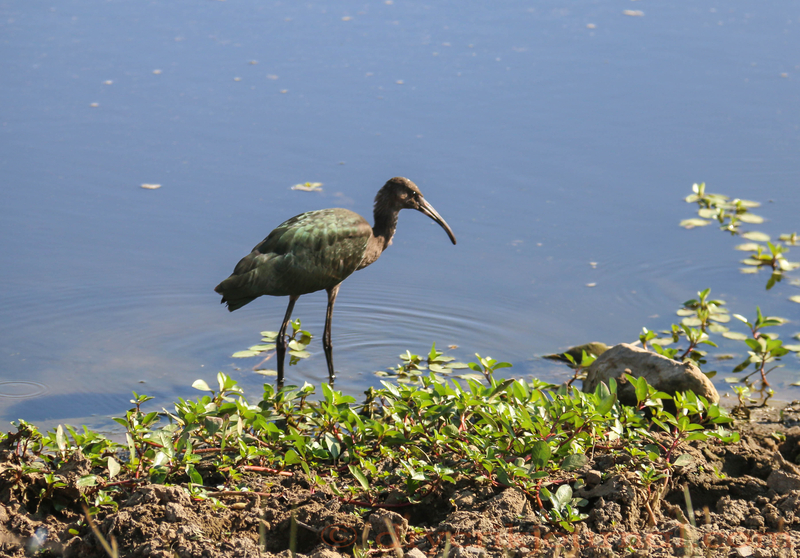 Perhaps this Glossy Ibis arrived with the monsoonal flow out of the Caribbean last week, as they are common to the East Coast. Often referred to as Black Curlews, they are shaped differently than our plumper and partridge-like Long Billed Curlews and behave more like Great Egrets and Blue Herons as shallow wading birds, though smaller than both. Try as I might to record this sighting with ebird, I failed. What distribution maps I found indicate no sightings in Central California. Amazing what you see when irrigating! 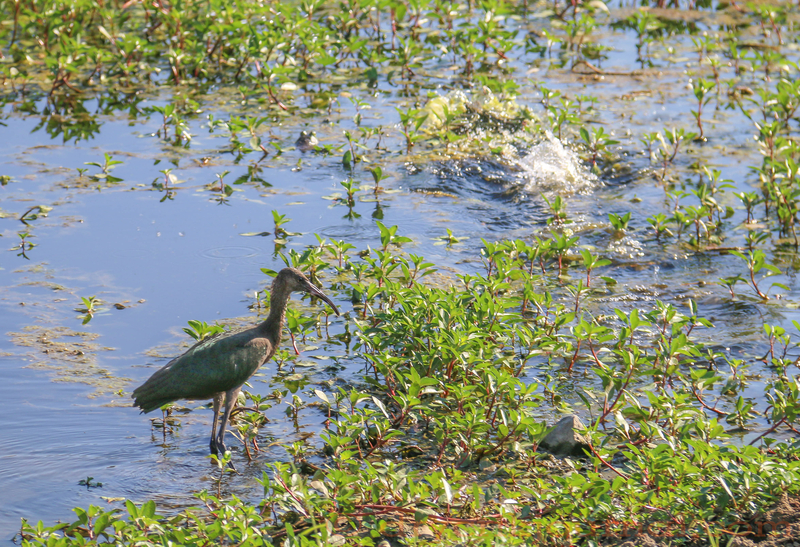 This entry was posted in Photographs, Ranch Journal and tagged Glossy Ibis, Plegadis falcinellus. Bookmark the permalink. Wow . How big is one of your bullfrogs? The worst thing about flood irrigating is that you only have narrow banks to walk on and the tiger snakes want to lie right there. I know nothing of Tiger Snakes, but the legs of 3 or 4 Bullfrogs make a fair meal. We will all, those of us in the San Joaquin Valley, California, are just about ready to learn a little more about the dynamics of water, etc. About 5 or 6 on the list of the deadliest in the world, very vicious and aggressive. I don’t like them because if you’re aren’t treated you could die within half an hour. Very interesting. I have never seen one. Isn’t it great how nature throws in a surprise now and then. Factoid; Curlews can cause quite a bit of damage to strawberry farms. They poke a 3/16 hole in a berry then go on to another. What I found most interesting in my research is that in 1914, according to the ‘Birds of America’ (c) 1936, is that these birds bred and nested in the marshes of Malheur Lake in southeastern Oregon. At the time of the writing, the birds were hunted and eaten in both Texas and Oregon. Is this single on its way to Oregon ahead of hurricane Delores? Wow – very cool John. Lucky you. And the pic is great too. There is a public Facebook site called Birding California where you could post a pic and some birders might have more info……..